With a title like Psycho-Circus, not to mention the presence of two Count Draculas (Christopher Lee and Klaus Kinski), fright fans will probably expect this to be some kind of lurid horror-thriller filled with circus acts gone horribly wrong (lion tamers mauled, knife thrower's assistant stabbed) along the lines of 1960's Circus of Horrors (stock footage from which appears here). 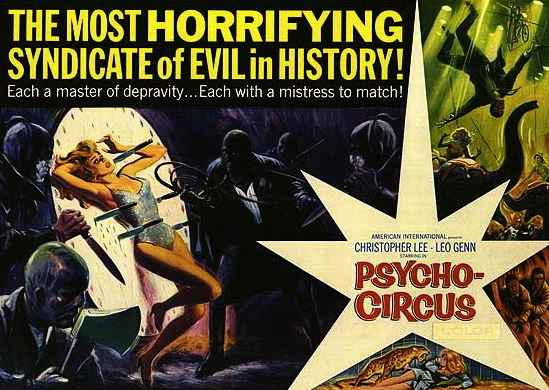 Unfortunately, Psycho-Circus is horror-in-name only; though it features a circus, there is nothing psychotic about it. Based on a story by Edgar Wallace, the film is more of a mystery-crime-melodrama, more accurately represented by its original title, Circus of Fear. Taken on its own terms, the film is a passable time-waster, though just barely. The plot kicks off with the nicely staged robbery of an armored car in broad daylight, abetted by one of the security guards. The stolen loot is hijacked, however, when one of the robbers is killed while trying to deliver the money to an accomplice at the circus. This sets up two mysteries: (1) Who was supposed to get the money; and (2) Who actually got the money? Unfortunately, the film is concerned with the mechanics of its gimmicky mystery plot that it forgets to ask, let alone answer, the most important question: Why should we care about the answers to Questions 1 and 2? Misleading artwork for the re-titled version of the film. This is a consequence of a typically fragmented script by producer Harry Alan Towers (writing under his Peter Welbeck pseudonym), which follows different characters in different plot threads, without ever winding them into a tight skein. There's no central protagonist or point of view, and the interesting bits must fight for attention with scenes that drag the pace to a crawl: the police attempts to solve the crime are interrupted by criminal attempts to track down the loot, which in turn must give way to behind-the-scenes melodrama at the circus. Though the anticipated circus carnage never takes place, eventually suspects and witnesses start showing up with knives in their backs, but that's so obviously a red herring for the knife-thrower that you almost wonder whom the film thinks it's fooling. Credit the scattershot approach to a combination of convoluted mystery plotting and more pragmatic concerns: a British-West-German co-production, Psycho-Circus is proto-Eurotrash cinema, a genre in which the need to satisfy investors from different countries outweighs the needs of the narrative. German money? Get German actor Klaus Kinski in there for a few scenes, whether or not he adds anything to the plot. One intriguing bit involves Lee's character, Gregor, the lion-tamer, who goes through most of the film wearing a mask, supposedly to hide scars inflicted by one of the beasts in his act - or is he really a criminal hiding his identity? Is he the man to whom the loot was supposed to be delivered, or did he purloin it to finance his escape, now that a dark secret in his past seems to be catching up to him? There might have been a fascinating film to be made that focused on these aspects; instead, these tiny threads are twisted and knotted with less interesting strands. Despite star billing, Lee is just one of the ensemble. At least his voice is distinctive enough to register while his face is hidden, and when he is finally unmasked he manages to generate a little pathos for a character who is a bit shady. Leo Genn is decent as the Scotland Yard detective on the case, but Kinski gets little to do except skulk around suspiciously. Production values are okay; direction is competent but unremarkable. The film could have benefited from more robust handling to push it out of the German krime territory and into the giallo genre; a little stylized violence would have gone a long way toward enlivening the drab plotting. The story winds up with one of those scenes in which the detective assembles the suspects to reveal the murderer's identify. If you're a fan of that kind of who-dunnit hijinx, it might be worth your while to sit through this one to the end. Just don't expect too much recompense for your patience. Though the revelation of Gregor's face is withheld until late in the British film, the trailer gives it away. Credits: Produced by Harry Alan Towers. Directed by John Llewellyn Moxey. Screenplay by Harry Alan Towers (as Peter Welbeck) based on Edgar Wallace's novel The Three Just Men (uncredited). Cast: Christopher Lee, Leo Genn, Anthony Newlands, Heinz Drache, Eddi Arent, Klaus Kinski, Margaret Lee, Suzy Kendall, Skip Martin. 90 minutes. Deceptively presented as a horror film, Psycho-Circus is actually a mediocre mystery-thriller with just enough good moments to be passably entertaining.